Just wanted to let everyone know that I'm working to get up posts from the last two or three weeks...spring migration was great, but hectic! I should have a number of updates and posts soon. The next morning I got up early to try and improve some of my photos from the day before. I started off in a spot for Mourning Warlber, and had one calling in the same spot we had looked the day before. It took me some time to realize that the bird was not calling from the ground and lower canopy (which would be typical) but was actually about 30 feet up in a nearby try. 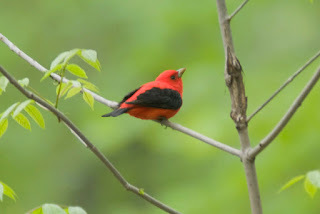 It was very cool to see this bird out in the open and calling, and again was one of the reasons I wanted to go upstate...birds that are rarities in the NY City parks may breed elsewhere, and you have a much better chance to see and study the bird. I drove the dirt roads to the marsh next, hoping to see the Least Bittern. It was calling as it had been the day before, but distantly. I weighed my options for a bit, and then decided what the hell, donned my shorts and rubber boots, and waded out into the marsh, leeches be damned. I moved towards the call as quietly as I could, holding my camera overhead, and with my recorder in my pocket, trying not to go too deep and thus ruin my gear. It took about a half hour to get close, and then I waited for another forty-five minutes. Finally, the bird moved and showed itself, edging out from the cat tails and giving me an amazing look (and photos!). I edged quietly back out of the marsh, amazed that my scheme had worked. I got my first leech of the season, and here's a photo of the little sucker. After that it was back on the road and down to Brooklyn. I checked the emails on the way down, and saw Matt Young had reported Anahinga (!! - very rare, southern species, also know as the Snakebird for it's long neck and habit of swimming with only its neck and head visible) not two hours south. The drive went by faster than normal as I was peering intently all around as I passed through the area the bird was seen. No luck there, nor with the reported Mississippi Kite at Bashakill, where I stopped briefly and where several other birders were intently searching (including Curt McDermott, Tom Burke, and John Haas). These fly-through rarities are tough, but I figure you try for enough of them and eventually you'll get lucky. Back in Brooklyn for a barbeque at around 9pm, and home, exhausted and happy, by 11. A great trip at a great time of year in Upstate. On my way back to Fort Drum I went through a small town called Antwerp, NY. As I approached the entrance gate I passed a few small houses, and suddenly saw a brown blur flash out into the road. I braked and stopped short immediately, but was too late. I had run over what turned out to be a feral cat carrying a kitten, and they were both in their death throes. I had a sickening few seconds trying to think what I would do if they did not die - they were both badly injured - but that resolved itself as first the mother and then the kitten lay still. I pulled over and talked to some teenagers up the block, and they said that the cat didn't belong to anyone. I was thankful that I hadn't caused anyone in the town a loss. I went back and lay the two at the side of the road, the kitten nested alongside the mother, and drove into Fort Drum. The next day when I left Fort Drum I stopped and looked for the cats, but they were gone. There was a dried bloodstain there on the road. I got upstate on Thursday night and slept in the car in a parking lot, and then got up early to pick up a couple of reported birds in the area. 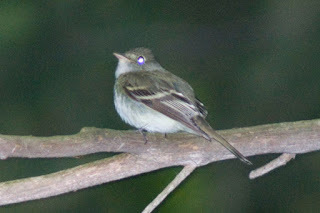 First stop was Whiskey Hollow, where an Acadian Flycatcher had been reported by Bill Purcell. The Acadian is one of a group of flycatchers that are most easily ID-ed by call rather than appearance...it's very similar to Acadain and Willow flycatchers, and not dissimilar to Least and Yellow Bellied. This is the time of year to study these birds since they are calling pretty regularly, and that let's you get a definite ID on them before studying their physical characteristics. The Hollow was just that...a wooded ravine with a natural spring and tall trees. I hiked into the area that looked right, and started walking. In about ten minutes or so I heard a faint call that sounded right, and another few minutes got me close. The bird was distant and seemed to be moving around quite a bit. As I came up on a clearing, I spotted a young fox, who saw me as well and ran off. I played the Acadian call a few times, and soon the bird was closing in, moving from perch to perch. I had my recording equipment and got the call on tape, and then finally got close enough to get some decent photos. 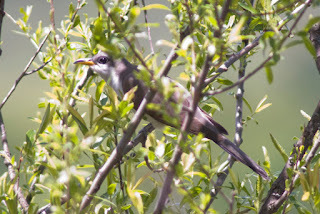 In the distance I heard a Black Billed Cuckoo calling, but missed getting it on tape as well. The whole seen seemed idyllic and beautiful--another quiet spot in NY State that I would have never known about if I hadn't undertaken this Big Year. After Whiskey I moved on to Lake Oneida, where a Sedge Wren had been reported by Andrew VanNorstrand in a marsh. With his helpful info, I was able to find the spot quickly (wearing my trusty rubber boots), and had not one but two Sedge Wrens calling back and forth to each other, and got a photo of one when it came up briefly to look around. This was an easy way to get a tough bird -- Sedge Wrens are few and far between in NY. 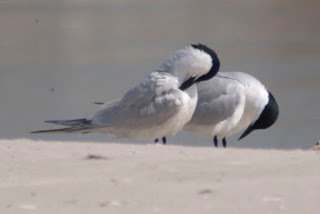 Nearby on Lake Oneida I had my first Black Tern, a beautiful tern with white wings and a black body. Now I headed up to Fort Drum to get my permit for accessing the military installation. I really had no idea of what to expect...maybe some big airfield, or a grassland or two? In fact, like many military installations, Fort Drum is mostly undeveloped land, which is periodically used for military training. It covers a vast area with mulititude of habitats, including large grasslands (good for Henslow's and Grasshopper Sparrows), wooded sections (20 species of warblers breed here, including the elusive Mourning Warbler), and marsh (good for Least Bittern). I stopped at the permit office and got my papers for the next days trip, to be led by Jeff Bolsinger, who has studied the birds at Fort Drum for over twelve years. I did a little birding the rest of the day at Perch River WMA (a distant Common Moorhen and some very close Marsh Wrens were the hightlights), had dinner, and then forayed out onto the installation at around 9pm for Whiporwill. Jeff had pointed me in the right direction and I had one calling in the distance, weirdly mixed with the sound of taps being played on the military base. The next morning I was up and ready to go, and met Jeff and the other trip participants at the permit office. We carpooled into the installation, and soon were in a giant birding playground. We quickly had Vesper Sparrow (common here), and Clay Colored Sparrow, both singing. 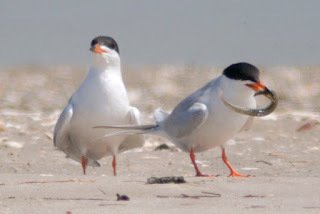 These birds which are tricky to see downstate are easy as pie at Fort Drum, which was part of my motivation for coming. 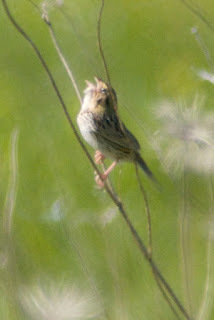 We also had multiple Grasshopper Sparrows, as well as a couple of distant Upland Sandpipers. Our next stop was a sandy open pine forest, where we had four(!) Red-Headed Woodpeckers, flying around and apparently still working out mates and breeding territories. These are really beautiful birds, and it's a shame that they have declined so severely in NY in the past years. It was treat to see more than one in one place. Next we headed out the large fields which, in addition to a helicopter graveyard, had several Henslow's Sparrows. Another tricky bird to see due to habitat, the Henslows needs fields that are mowed infrequently, which has become rare in the state. 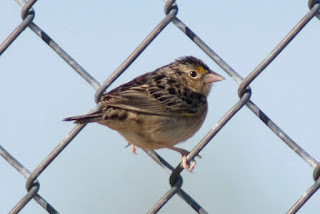 Henslows are similar to Grasshopper Sparrows, and at a distance might be hard to ID. One trick Jeff taught me is to watch for how long the bird throws its head back in song...a very brief movement is Henslows, because its song is so much shorter than Grasshopper. We could see this on a distant bird that was too far away to hear the song clearly, but who we could see was singing with quick snaps of the head. We wrapped up looking for warblers, notably the Mourning, but as it was later in the day now the birds were mostly quiet and we didn't have any luck. The group disbanded, but I followed Jeff out to nearby Cape Vincent to check out a reported pair of Marbled Godwits. I then turned around and went out back to Fort Drum. I've been birding Prospect Park heavily during migration, and I'd gotten most of the likely species I could see, so I decided to go upstate for a couple of days and try and fill in a few birds that are easier to see up there than down here. The trip started on Thursday with a drive up to Sterling Forest and Bashakill with Peter Dorosh and Tom Stevenson. We got up to Sterling Forest in the early morning in some of the clearcuts made by power lines. These are traditionally good spots for Golden-Winged Warbler, and withing a few minutes we were hearing one sing nearby. 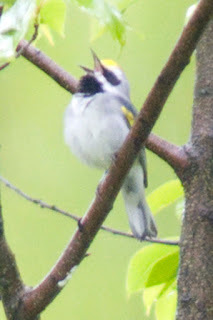 The Golden-Wing is threatened by hybridization that has been going on in recent years -- yet another form of "threat" to a species -- as it mates with Blue-Winged Warblers (producing Lawrences and Bresters Warblers, through direct and backcross mating). That means that it's one bird that you can't necessarily judge by call alone, since all four warblers seems to be capable of similar calls. Over the next half hour or so we tracked it (in part through Tom's incredibly good ear-birding skills), and finally had it perch out in the open about fifty feet away-a full-bred, beautiful Golden Wing. The weather was on-and-off rain and sun, and we figured it was a good time to go further upstate to Bashakill. I hadn't seen Bashakill before, and it was really spectacular that day (I've posted a video below). Big open marsh habitat that you rarely seen in New York, with forest surrounding it. The turbulent weather made it even more dramatic. This is a good place for Moorhen and Rail, Sora, Mourning Warbler and Flycatchers. Again Tom's ear birding came to the fore...now that the trees are fully leafed out, you find birds more through hearing than seeing, so his skills are invaluable to helping find the hidded birds. We had a Willow Flycatcher pretty quickly, lots of Swallows, Osprey, Louisiana Waterthrush, probable Alder Flycatcher, and a surprise Bald Eagle flyover. We also had a Sora make it's cool whinny call, which is great to hear in real life and not as a recording. After Bashakill we checked out Liberty Marsh, and got another Sora calling loudly and consistently. At one point I was within ten feet of it, but I never got to see it. 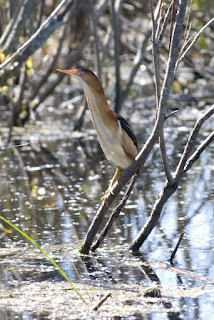 These birds are masters of skulking, and they can get down in the reeds right under your feet and remain out of sight. I did get a good recording of the call though, and I hope to get a photo to augment it at some point in the next few months. At Liberty we also ran into Curt McDermott, who had the amazing Hoary Redpoll at his feeder this winter (I think he said it was there every day for over eighty days!). 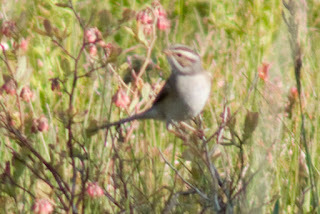 Curt, friendly and generous as always, took us over to a nearby spot for Grasshopper Sparrow. 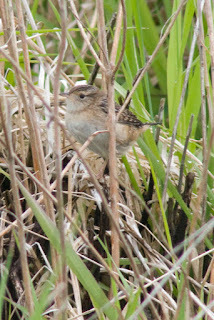 We got good looks at a couple of these little birds staking out their section of meadow with their high, tinkling calls. That was enough birding for the day and we parted ways, Peter and Tom heading back to the city, and me heading several hours north to Fort Drum. link and email me with your pledge and information. Thanks! The big wave of migration over the weekend has slowed a bit, as is natural, and so I took the opportunity to hit Jones Beach today for Gull Billed Tern, which had been reported over the past few days. The weather was definitely beach weather, so it seemed like a perfect fit. I ran into Ken and Sue Feustel at the Coast Guard Station where the birds had been seen the day before. They have worked extensively on the new Breeding Birds of New York Atlas for 2000-2005, which documents the birds that have nested in the state, so they know quite a bit about the birds of NY. We had a nice chat and then I settled in for the next couple of hours watching the sandbar just off the dock as the tide receded. Birds feed in the mudflat here when it's exposed, and there was a lot to look at. While I was there I had first Forster's and Common Tern, then Gull Billed (perched very close), and finally two diminutive Least Terns, who came in to settle for a while. The terns are some of my favorite...sort of an elegant verion of a gull, their flight is buoyant and graceful, and they have bright, contrasty markings. Some terns plunge-dive for food, and it's great to see them bob through the sky and then plummet into the water, wings tucked. It got hot enough to sunbathe and bird at the same time, so that's what I did. 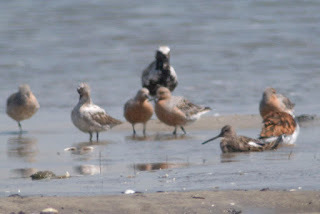 A mixed flock came in to feed for a while and I got good looks at Red Knots, Semipalmated Plovers and Sandpipers, Sanderling, Ruddy Turnstone, Willet, Greater Yellowlegs, Black Bellied Plover, and Short Billed Dowitcher (including a very odd looking, almost leucistic molting bird). Sitting out there I must have been quite a site: camera gear, scope and tripod, three bird books, shoes and clothes scattered, and loving it! It's been a very busy few days! The first big wave of migration started on Friday, and on Saturday and Sunday the birds were in the city parks in full display. Peter Dorosh led a park walk on Saturday that had 23 species of warbler (the most I'd had in a day to that point was around 10). 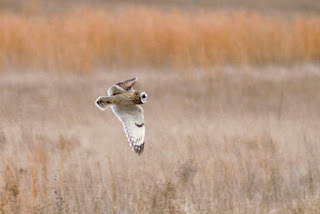 Rob Jett and I went out in the morning before joining them and found a similar bounty of birds. 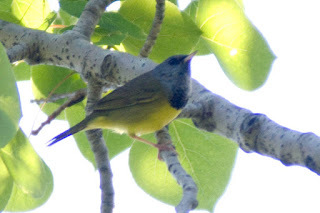 Kentucky warbler had been reported in the Brooklyn Botanic Gardens from Friday night, so we were hoping to find the bird there on Saturday...unfortunately the gardens were having their cherry blossom festival, so they closed off the area where the bird had been seen. Rob and I spent a very frustrating hour walking the perimeter of the fenced in garden hoping to catch a glimpse of the secretive and rare bird, but to no avail. Rob is a great "ear birder", meaning he can ID birds by their calls, or by parts of their calls, which is especially useful now that the trees have blown their leaves and the birds have lots of cover. Warbler watching can be pretty challenging, as a lot of these small creatures feed high up in the trees on insects, and are often far overhead. It takes patience and a strong neck to track their movements until you can figure out what they are, and it takes good ears like Rob's to know that they are up there in the first place. The rewards are great, though, as the park is full of song and color when they are around. 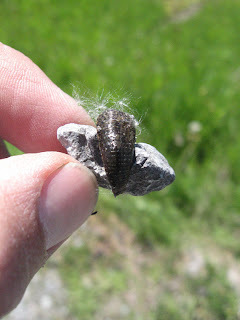 I was out from 6am until 7pm, and had about 80 species in the park. Sunday was equally good, and the weather was better. I started in Prospect Park, but then got two texts in as many minutes...Lark Sparrow in Greenwood Cemetary and Kentucky Warbler in the Rose Garden in Prospect Park. I picked up Peter and Rob and we raced over to the cemetary. It seems like a strange place to bird, but Greendwood is one of the great green spaces in Brooklyn. Monk Parakeets nest over the main entrance, and I had gone to see them earlier in the year. 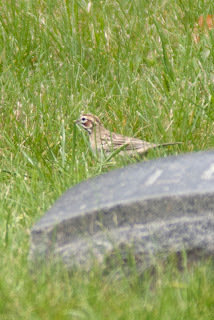 Now Steve Nanz had relocated the Lark Sparrow further into the cemetery (it had been seen the day before, like the Kentucky). We spent a few comical minutes on the intentionaly meandering roads before we found the spot the bird had been seen, and we got out and started searching. We wandered apart and worked the area, and at least 20 minutes went by without luck. I started to get that sick feeling that we'd never find the bird, and that I'd have to spend the next six hours fruitlessly wandering the cememtary, when my Rob called my cell and said he had it! I rushed over and we stood about 20 feet from this striking sparrow...the only other one I'd seen was in Texas, and it was a long way from home here. Steve Nanz came around with his awesome photo rig (400/2.8 lens with two extenders, plus tripod and gimbel mount...very serious photo gear) and got some great shots. After a few minutes we tore ourselves away and raced back to Prospect for the Kentucky. Again, we spread out and looked/listened for any sign...again about 20 minutes passed before Rob heard the call, and then heard it again, homing in on the warbler. Within a couple of minutes we were seeing the bird in all its glory, hopping nonchalantly out in the open and feeding in the path. 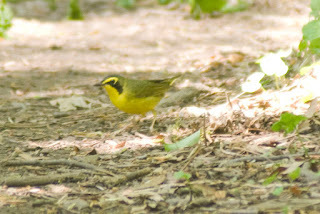 Nearby was a hooded warbler, as well as a common yellowthroat, and it was a delight to have all three birds, each bright yellow with black facial marks, flitting about in the same place. 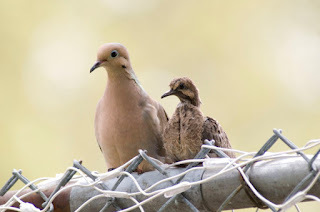 Other highlights of the weekend was a mourning dove with chick, dozens of Baltimore Orioles, Orchard Orioles, Scarlet Tanager, and many, many warblers. The first wave was great, and there should be one or two more to go. It's a great time to be outside!